Middle East Unmanned Aerial Vehicle market registered healthy growth during 2014-17; buoyed by several key factors including growing usage in personal & recreational applications such as travel/event photography, adoption for monitoring and mapping, and increasing inclusion of UAVs by the armed forces in the Middle East region due to need for advanced their cost effectiveness has marked the region as a potentially lucrative market for foreign as well as domestic manufacturers. According to 6Wresearch, Middle East Unmanned Aerial Vehicle (Drone) Market is projected to grow at a CAGR of over 30% during 2018-24. Defense UAV segment accounted for majority of the revenue share owing to increasing purchase of these by various countries in the Middle East region. Chinese manufacturers have displayed a positive inclination to supply armed UAVs to countries such as Iraq and Saudi Arabia, which has increased their penetration in the Middle East region. Additionally, Israel and Turkey have upgraded and increased domestic production of the defense UAVs, and are soon expected to compete in the Middle East region. Commercial UAVs are primarily getting adopted for personal usage and industrial & construction areas. Industrial & construction application of the UAVs accounted for majority of the revenues for commercial segment and are utilized for area mapping and pipeline surveillance & monitoring in oil & gas sector. 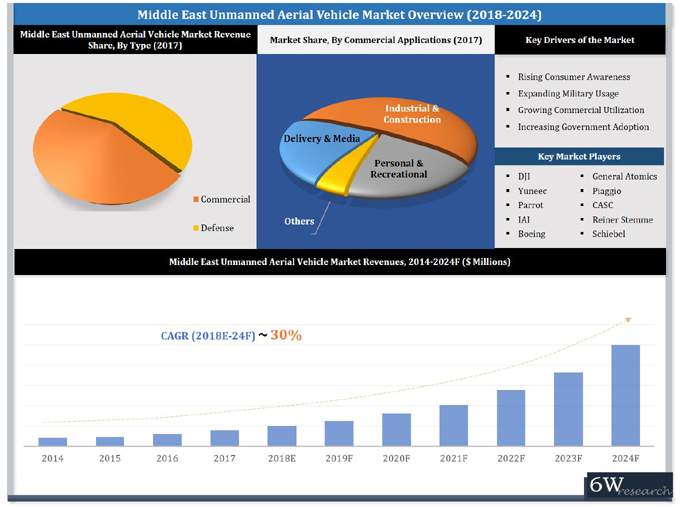 Some of companies in the Middle East UAV market includes, DJI Technology, Yuneec International, Parrot, Israel Aerospace Industries, Boeing, General Atomics, Piaggio, China Aerospace Science and Technology, Stemme, and Schiebel Technology. The report thoroughly covers Middle East unmanned aerial vehicle market by countries, types, and applications. The report provides an unbiased and detailed analysis of the on-going trends, opportunities/high growth areas and market drivers which would help the stakeholders to decide and align their market strategies according to the current and future market dynamics. 14.1 SZ DJI Technology Co., Ltd.
14.2 Yuneec International Co. Ltd.
14.4 Israel Aerospace Industries Ltd.
14.7 Piaggio Aero Industries S.p.A.